Since 2007 an unknown subject has sent more than 360 letters containing a white, powder substance to various government officials, public schools and other locations. In May, 2011 20 letters were delivered to public schools in Washington, DC. Over the past two days similar letters have been received in Washington, DC; New York, New York; Dallas, Texas and Enfield, Connecticut. The WRTAC produces Information Bulletins in response to changes in the threat environment from terrorist attacks, natural hazards, criminal developments, and other events. 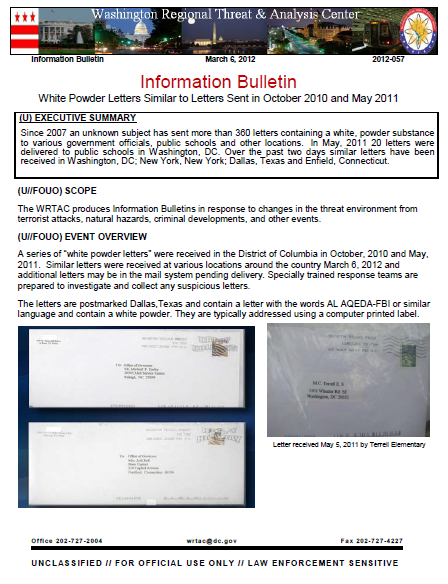 A series of “white powder letters” were received in the District of Columbia in October, 2010 and May, 2011. Similar letters were received at various locations around the country March 6, 2012 and additional letters may be in the mail system pending delivery. Specially trained response teams are prepared to investigate and collect any suspicious letters. The letters are postmarked Dallas,Texas and contain a letter with the words AL AQEDA-FBI or similar language and contain a white powder. They are typically addressed using a computer printed label. (U) Indicators of Suspicious Packages and Envelopes. Suspicious packages and envelopes often have characteristics that can alert handlers or recipients to potentially harmful contents. • A handwritten or poorly typed address. • Misspellings of common words. • Strange return address or no return address. • Incorrect title or title without a name. • Not addressed to a specific person. • Marked with threatening, insulting, or disparaging language. • Postmarked from a city or state that does not match the return address. • Powdery substance felt through or visible on the package or envelope. • Oily stains, discolorations, or odor. • Lopsided or uneven envelope. • Excessive packaging material such as masking tape or string. o Protruding wires or aluminum foil.